Used to be an old myth that rebuilding a feedwater heater takes longer than installing a new replacement, or that it couldn't be done with the unit in operation or on-line. Not any more. Today's rebuilding companies can rebuild aging units in a matter of weeks, keeping plant downtime to a minimum. In many cases, rebuilding can proceed with the plant on-line, so that even plants with only one string of heaters can continue to generate electricity. Plants can now rejuvenate old heaters without having to resort to a planned outage. For generating stations that need a new feedwater heater right now, the option of going with a rebuilt unit on-site makes even more sense, as new replacement units can take a year or two to manufacture, all the while the plant is operating in a derated capacity and is forced to burn more coal. Whereas a quick rebuild can return a plant to designed capacity in a matter of weeks. Ultimately, though, the fact that rebuilt units save anywhere from 25-50% of the cost of a replacement unit makes the argument for rebuilding hard to ignore, especially in the face of today's economy. "It required four weeks to completely rebuild two heaters, and by rebuilding over buying new feedwater heaters we saved about one-third the cost," says Nick Samford, the Engineering Supervisor at NRG's Limestone, Generating Station, in central Texas. Failure to take advantage of the tremendous saving afforded by rebuilding often stems from the perpetuation of untrue myths that rebuilding takes too long, or that it can only be done during a scheduled downtime. This simply is no longer the case. For example, many utilities are forced to operate with "dead" heating units on the belief that they must go off-line to repair the problem. The situation is particularly acute for smaller plants relying on only one string of feedwater heaters. Without built-in redundancy, engineering staff traditionally felt their only option was to order a brand new heater, which can take over a year to build from scratch. In the meantime, the plant would limp along in a derated status, burning more coal, thus driving down efficiency. However, this old way of operating wanes in the face of today's reality that rebuilding companies can now overcome any lack of redundancy within the facility. 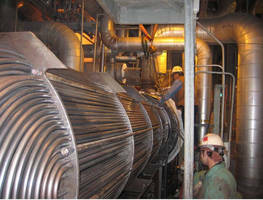 "For about half of the heaters we rebuild, we isolate the heater and re-tube it on-site while the unit is on-line, by isolating the defective heater," says David Grimes, an Engineer at American Power Services (APS) of Erlanger, KY, a provider of heat transfer equipment services that include troubleshooting and repairing, to complete rebuilding projects. "Bypass lines can be installed so that the rebuilding can proceed without the plant having to wait for an outage. This, by itself, saves money." Contrary to the opinion perpetuated by some heater manufacturers that on-site rebuilding can't take place at all sometimes; it is a complete replacement that often proves impossible. "When you buy a new heater from a manufacturer, it will typically come already assembled and ready to be installed,¡± continues Grimes. "But we've seen cases where there was not sufficient room to physically get a new heater into position. As a plant expands over the years around the original installation, extra equipment gets installed and before you know it, the heater that was once in the wide open is now behind three walls. In contrast to installing a replacement heater, a rebuilding project can still take place within those same space constraints." Any doubts that rebuilt units can't match the thermal efficiency of new replacement units are quickly dispelled since the original tube material can be changed during a rebuild to actually improve the thermal performance of the original design. Additionally, a rebuild or retubing can extend the life of an existing heater by 20 to 30 years - just as long as a total replacement but at far less capital expense. Additionally, many components that once were considered obsolete and/or not reusable such as the tubesheet, channel and shell can be returned to as new condition. Advanced rebuilding techniques and tools make quick rebuilds possible. With a mindset of time and cost-effective repair and service - versus throwing everything out and starting from scratch - the rebuilding process begins with testing and troubleshooting analysis. Sophisticated equipment determines the exact location, nature and severity of a problem via eddy current, ultrasonic, dye penetrate, magnetic particle, hydrostatic, and boroscopic testing procedures. With testing data in hand, a rebuilding company can make recommendations on cost-effective options for remedial correction, retubing to original specification, or rebuilding to improve performance. Specialized tools have done much to speed the process. Hydraulic tube pullers, power tube strippers, tube joint milling tools and plasma arc ID tube cutting facilitate the rebuilding process. Additionally, new technology allows for defective or leaking tubes to be explosively plugged with the unit on line by utilizing a robotic arm to install the required tube plugs. Doing so provides a safer method of installing tube plugs by not having to place personnel in harms way. Founded in 1989, NRG Energy, Inc. is a wholesale power generation company, primarily engaged in the ownership and operation of power generation facilities and the sale of energy, capacity and related products in the US and internationally. The company's global portfolio of projects totals over 24,000 net MW. Located between Houston and Dallas, NRG's Limestone station is a coal-fueled plant with two units: 836-MW and 864-MW. Both of the OEM heaters had been in service for over 20 years. However, the desuperheater was a little too large, resulting in saturated water exiting at excessive velocities that caused tube erosion. "We initially considered buying completely new heaters, but ultimately decided not to because of the additional cost," continues Samford. APS undertook the rebuilding job, utilizing its ASME Code shop and 50 certified and trained heat exchanger technicians, code welders, as well as their NDE staff. The process started with a failure analysis that identified vibration in the desuperheating zone as a cause. APS then redesigned the desuperheater to eliminate the wet wall condition of the tubes and to reduce the velocity of the steam entering the desuperheater while maintaining the original design thermal and operational parameters. Work began in late February 2009. The internal structure was rebuilt while changing the steam inlet location. Additionally, the desuperheater flow path was rerouted during the rebuilding process. In order to speed up the process, a specialized motor driven plasma arc cutter was used to remove the hemi head in order to facilitate better access to the tubesheet during the rebuilding process. This additional space directly led to a more efficient rebuilding project by providing full access to the tubesheet, rather than working inside the hemi head. This allowed the use of efficient tools to quickly pull the tube stubs, weld the new tubes to the tubesheet and mechanically expand the tube ends into the tubesheet. The job finished within 25 days. The work was completed per code and per insurance regulations within the time frame of a scheduled four week inspection outage. This rebuilt feedwater heaters allowed the Limestone plant to facilitate superheat at exit of the desuperheater, thereby eliminating the wet wall condition. As a result, either of the two units can be taken off-line and the plant can still generate 100% power output. Since the condensing zone steam velocity was increased, thermal efficiency improved slightly. "By rebuilding over buying a new unit, we saved our company money," says Samford. For more information, contact American Power Services at 2788 Circleport Drive; Erlanger, KY 41018; 1-859-283-1230 or 1-800-535-6649; fax: 1-859-283-1395; info@1aps.com or www.1aps.com.